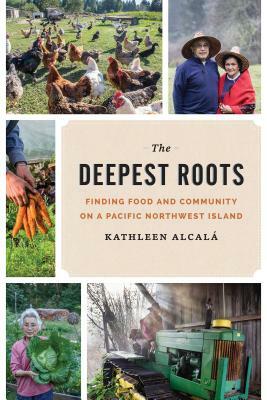 The Deepest Roots: Finding Food and Community on a Pacific Northwest Island (Hardcover) | Eagle Harbor Book Co.
As friends began "going back to the land" at the same time that a health issue emerged, Kathleen Alcal set out to reexamine her relationship with food at the most local level. Remembering her parents, Mexican immigrants who grew up during the Depression, and the memory of planting, growing, and harvesting fresh food with them as a child, she decided to explore the history of the Pacific Northwest island she calls home. In The Deepest Roots, Alcal walks, wades, picks, pokes, digs, cooks, and cans, getting to know her neighbors on a much deeper level. Wanting to better understand how we once fed ourselves, and acknowledging that there may be a future in which we could need to do so again, she meets those who experienced the Japanese American internment during World War II, and learns the unique histories of the blended Filipino and Native American community, the fishing practices of the descendants of Croatian immigrants, and the Suquamish elder who shares with her the food legacy of the island itself.